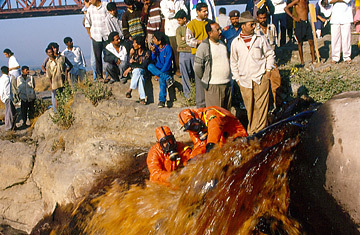 Greenpeace activists collecting samples of effluents being released into the Damanganga river from the Vapi Industrial area. If India's environment is on the whole healthier than its giant neighbor China's, that's because India is developing much more slowly. But that's changing, starting in towns like Vapi, which sits at the southern end of a 400-km-long belt of industrial estates. For the citizens of Vapi, the cost of growth has been severe: levels of mercury in the city's groundwater are reportedly 96 times higher than WHO safety levels, and heavy metals are present in the air and the local produce. "It's just a disaster," says Fuller.